Bead Up -- the journey of handmade jewelry: 2 years on Etsy = GIVEAWAY!! Today marks Bead Up's 2-year anniversary of selling on Etsy! Though is may sound cliche, it is REALLY hard to believe that I have been selling jewelry for 2 years now. I can only imagine the crazy huge amounts of free-time I had before embarking in this very full-time hobby! The journey hasn't always been metal roses and birds nests, however. 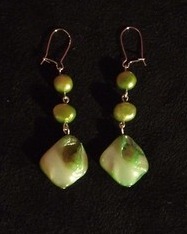 Though I technically opened my shop for business on August 19, 2008, I initially only put up a measly 2 items for sale: a glasses lanyard and these green earrings, made of pearls I bought in China. And though I posted them for sale in August, it took me over 2 months to make my first sale (of said green earrings)! I was SO thrilled that the earrings finally sold that I still have the little "thank you" note the buyer sent with her payment (before the days of Paypal)! And come to think of it, my mom is the only one who has ever "bought" the glasses lanyard. Figures! Now, 2 years and 200 sales later, I am thrilled to say that I consider my work on Etsy both fulfilling and successful, if you will. Though my sales aren't in the thousands, my ratings are a unanimous 100% satisfaction, which is one of the few things I take great pride in :) Add that to the hundreds (literally, hundreds) of sales I have made in person and off of Etsy, plus that one order of 200 custom necklaces from earlier this summer, and you have an average of about an item sold a day. I like those odds. Or the yet-to-be-released, twist on a classic! To enter: just leave a comment on this blog post listing your favorite item in Bead Up's shop - the Fall Line is growing in numbers and I would love to hear what you do (or don't!) like! For additional entries: "like" Bead Up on Facebook, "favorite" Bead Up on Etsy, or follow this blog (please leave an additional comment for each extra entry you make)! Here's to another 2x200 years of Etsy-ing! I have to be honest, your birds nest is my favorite item. Though it is tough to say since everything you make is so beautiful! I love to just look through your shop. Yay, happy 2 years! 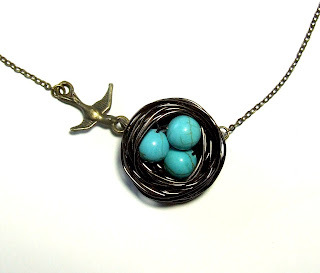 I love all versions of the birds nest necklaces...so pretty. I like Bead Up on facebook! I (of course) already follow your blog! Bead Up is one of my favorites on Etsy. I like Purple, Gold, Brown, Black, and Wood Ribbon Necklace. I really love the all of the Birds Nest wire wrapped. The wire and beads look great together, more of that kind of jewelry would be stunning! I love goldleaf and gemstone earrings. beadup is an etsy favorite. I also love the last necklace on this page. I love the "Reach for the Stars" necklace!! You're a favorite on Etsy. my fave item in your shop is the Chinese Coin and Gemstone Charm Bracelet! email in profile. i follow your blog! email in profile. i hearted you on etsy! email in profile. i like you on fb! (katie hanson) email in profile. I love the kindness freshwater pearl necklace! I love the FAITH ring silver necklace! Congrats, friend! What a great accomplishment. I'm glad to have been a part of your journey these past couple of years! My favorites in your shop right now are any of those freshwater pearl bracelets ... Simplicity, Kindness and Serenity are all beautiful! Congrats on two years!! That's an incredible accomplishment. My favorite item is the Chinese Coin and Gemstone Charm Bracelet! Love the White crystal and blue ribbon with silver broach necklace. Very pretty and unique!! Congrats on 2 yrs and 200 sales!! I love how bright and colourful alot of your jewelry is! I think the Simplicity Freshwater Pearl Pink and Purple Bracelet is beautiful. I love the Chinese Collage Bracelet! I adore the click and shoot necklace with that tiny camera — so beautiful! I love the bird's nest necklaces also! I love the wine charms and the bird's necklace best! Congrats on two years and over 200 sales! Cheers to you!! Congrats on 2 years! 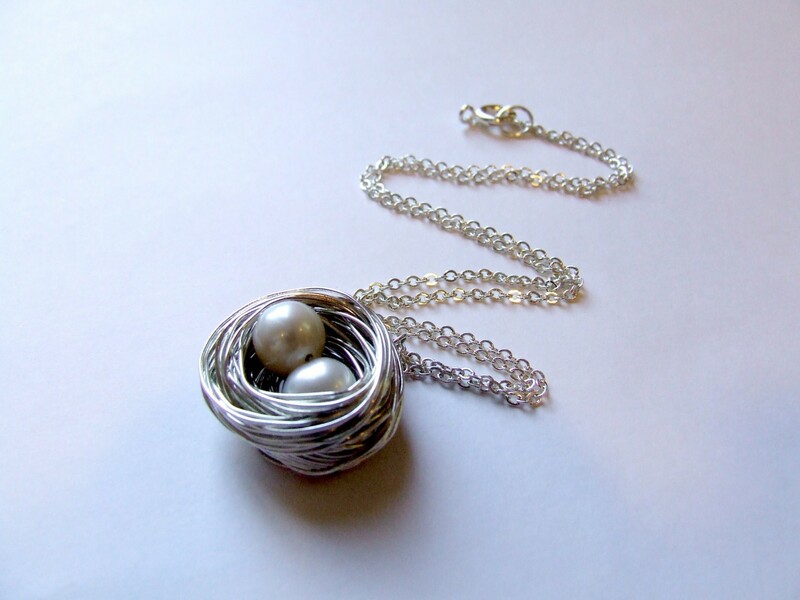 I adore the Bird's Nest Wire Necklace, beautiful! I looked through all your items and I have to say the birds nest necklaces are my favorites; all the choices are great, I'd love the new twist on the classic. Congrats on 2 years. perhaps it's because I am of asian descent...but I LOVE Brass Chinese Coin Pendant necklace!!!!! It is stylish and has that antique but alluring look and is just the right length! congrats on so many sales! and thanks for this giveaway! Looking through your store I like the Serenity Freshwater Pearl Aqua and Green Bracelet and the bird nest necklaces. My absolute fave of your items would definitely be your Gold and Salmon Pearl Cluster Necklace. So BEAUTIFUL! Followed your blog ;D again, either of the twists haha. I like the "Amy Butler Fabric and Wooden Bead Necklace with Pink Ribbon"
i love Amethyst and Agate Gemstones with Pearl Coin Earrings! i favorited your shop on etsy!! Congrats on 2 years! You have lovely things in your shop. I love the Silver Black Bird Tag Gemstone Necklace and all of the nests! I love the Jade and Gemstone Bronze Bracelet. All of your pieces are beautiful,but I have to say that my very favorite is the yet-to-be-released, twist on a classic! I like your page on facebook. My FB name is Kimberly Pate-Lewis. Added your etsy to my favs! My etsy name is KimSecrets. Hello! My favorite from the shop is the Gold-Bohemian Wooden Necklace. To me it represents our reality: diverse culture, one world. I'm a new follower via GFC! I'm fisiwoman! "like" Bead Up on Facebook as Monika Lintang Retnani. Follow this blog via GFC as Monik. I love the Purple Amethyst and Burnished Silver earrings. Oh wow, I love everything in your shop! there isn't anything that I don't love there, really! One of my favorite items is the Green Gemstone, Wooden Beads, and Purple Ribbon Necklace, it is absolutely gorgeous! I could keep going on and on about all the items that I love from your shop! I really love your Jade and Gemstone Bronze Bracelet and Earring Set. SO pretty! I like you on FaceBook as JanineNenemanMoore. I like the Purple Amethyst and Burnished Silver earrings. I love the White crystal and blue ribbon with silver broach necklace! I love the color of the ribbon, the beautiful broach, and the overall balance of the necklace. It's perfect!! I love the brass birdie goes to its nest! I love the Thrive brass necklace. I like the Gold and Green Swarovski Crystal Necklace. I love your BUZZ BEE Necklace! So cute. I think my favorite nest was the yet-to-be-released one??? Cannot stop drooling over the Cerulean Blue Crystal and Gold Loop earrings, myself. Congrats on your anniversary! i LOVE the coin bracelet! Gold leaf and gemstone earrings are so pretty! lov the birds nest nclaces! I know you listed it, but I LOVE the Brass Birdy goes to his nest. I added beadup as a favorite. (Penelopeplum). My favorite is the Birds Nest wire wrapped pearl necklace. My favorite is the classic birds nest necklace....I adore it, I have to say! i love hearing about your adventures, both with bead up and in general! the rose necklace that says "bloom" is my favorite, and i wear it even more often than i expected to! beautiful, understated and inspirational all at once. stay tuned for a new order soon! Didn't see the extra entries part! :> (of course) I like Bead Up on Facebook! I love the bird nest necklace! I have the "classic" version and get complimented everytime I wear it. I have a pearl for each of my 3 children and it always makes me feel close to them when I wear it. I love this necklace! It is so cool!! My favorite items are the Brass bird nest necklace and the Serenity Freshwater Pearl Aqua and Green Bracelet. Beautiful jewelry! congrats christyn! i love it all! it looks great :) hope you all are doing good!! It's hard to choose a fave, but the "Thrive" necklace really speaks to me!